Welcome to Quarters at Wolf Bay! Emerald Coast by Owner is proud to offer you some luxurious vacation rental condos located right near the waters of the bay. Around here, there’s no such thing as a bad time. There’s a lively restaurant called the Wolf Bay Lodge right near by, with a cool scene, great food, and a nice bar. This place has a lively scene and a fun attitude so everyone has a good time. For fun, you can go to local helicopter tours and fly above the area, enjoying some nice scenery you can’t get anywhere else. You can also make a trip to the water right by your condo, or head to the beach. The beach offers such things as parasailing, paddle boarding, deep sea fishing, boat tourism, fishing off shore and much more! Some other great restaurants besides Wolf Bay would be Cotton’s Restaurant and Shipp’s Harbour Grill, these two places offer great seafood and surf n’ turf, freshly caught daily. Both restaurants provide great service and awesome views of the coast while you enjoy your meals. 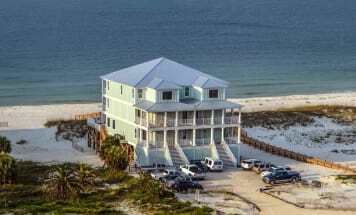 Emerald Coast by Owner is proud to bring you our selection of vacation rentals. Browse our listings at Quarters at Wolf Bay and book online today! When you book with Emerald Coast by Owner, we make it easy for you to choose where, when, and what you want to do on your trip. Contact us with any questions!